We were waiting for Scott’s phone to download a video from “Epic Meal Time”, some extreme food show, when a tribal member came over to invite us to the plank house. During this specific week and weekend, the Confederated Tribes of Grand Ronde was holding a Powwow to honor all Veterans. Although the main event would take place during the weekend, there were smaller, more intimate events going on for those who had come to camp out early. And because of this, I was personally shocked to have been invited. A couple of us forgot about Scott and his video (sorry Scott!) and literally jumped up to follow the tribal member to the plank house. As soon as we entered, the smell of burning cedar greeted us. There was a small gathering of people sitting in the stands with a fire pit centered between them. We sat near the entrance, quietly but excited we all patiently waited for the ceremony to start. Others from our camp came a little after us, they at least got to see Scott’s video. And then, the event began. We did our best to go along with the event. We stood up when everyone stood up and sat down when they all sat down. We had the chance to hear the history of the building, staring in awe at the size of the cedar pillars. They told creation and traditional stories throughout the event. We participated in a dance called the Heron dance. We would jog around the building and when a certain beat was made we had to stop immediately, go side to side, forward and when we leaned back we threw our hands in the air and shouted “Hey!”. I found it fun but also educationally and personally important that we went. Field Methods in Indigenous Archaeology is a community-based project, meaning that we have been working side by side on an equal pedestal with the help of community members. Although we are excavating the schoolhouse with the CTGR’s permission, we have been working closely only with a handful of tribal members. Attending this event gave us the opportunity to interact with different members, members who maybe weren’t so keen on outsiders coming, members who are hesitate about trusting archaeologists. Often times, as school-oriented students, it can be easy to place history in an unreachable distance, making it harder to grasp the reality of it. For me, I can read all about archaeology and the methods and tools that come with it, but it’s a completely different experience when I go out into the field and put them in practice. And it was the same with learning about the history of the CTGR. It’s hard to actually understand a culture until you can interact with it. Words can only do so much and can only paint a mental image so detailed. Seeing it person, for me, was a reality check. I was reminded of them not completely trusting us as archaeologists, as one elder put it, he’s “watching us”. When he spoke these words, I could feel the long and deep distrust Native Americans have towards archaeology. It was a reminder that the people whose presence we were in are descendants of the ones who went to the school house. This added to the amount of pressure on us. But also a served to remind us that what we are doing, working with the Tribal Historic Preservation Office, is a great honor. And it is important to be respectful. What does Archaeology mean to me? As a caretaker of artifacts, I know the importance of archaeology. I understand that I would not have some of the things that are in the collection I take care of if it were not for the archaeologist that did the work. Being able to participate in this project has helped me to understand the process that some artifacts go through before they are placed on my desk. After learning what I have so far, I have a new level of respect for people in this field. As a tribal member, this project honestly made me a little nervous at first. My community invited people from outside to come in and start digging on our reservation. We have visited many of our important places, discussed sensitive topics with them and allowed them to live in our community. Once I was able to learn about community based archaeology and actually see the practices being used, I wasn’t as nervous anymore. It has also helped that my peers are respectful and kind. I know the importance of archaeology and I am very thankful that we ended up with the project leaders that we have. To see others get so excited and be genuinely interested in my community makes me happy. Although the chance is very slim, I am still afraid of disturbing an ancestor. My professional mind understands this field of work while my personal feelings tell me to leave things as they are. It is challenging to work on something so important when you have to battle with personal feelings. I also get a little nervous about the community’s reaction. Once the other students are gone, they are gone. I will continue in my community and I don’t want this project to cause any negative feelings. Over all, I am glad that I can be a part of this historical event and that I am able to help educate my fellow classmates. Preservation is, obviously, an essential part of archaeology; if artifacts aren’t preserved then archaeologists don’t have anything to study. There are many perspectives, ideologies, methods, and budgets that must be taken into account. The viewpoint that is most often thought about and highlighted is that of the academic. The academic perspective on preservation tends to run along the lines of everything should be preserved in a museum forever for future study. As a student this is the perspective I am most acquainted with but it is not the most relevant. The perspective of the indigenous group that the site in question actually belongs to is one that is often overlooked or dismissed by other stakeholders. It is extremely valuable and should be, at the very least, taken into consideration. The indigenous opinion tends to be thought about as one homogenous outlook without considering the diverse opinions between and within each community. Each individual likely has a slightly different outlook on preservation. Through our work with the Tribal Historic Preservation Office I have learned about some of the strategies The Confederate Tribes of the Grand Ronde employ. Some of these methods include things like keeping sites private from the public, hiding sites in plain view, and turning them into tourist destinations for people to come and learn. These options are not always viable though. More often than not the tribe does not legally own the land the site is on. In these cases compromises must be reached but there is no guarantee that these arrangements will turn out in favor of the indigenous group. Many times the do not have any laws to use in their favor or the laws that can be used don’t have any way of being enforced. Another issue that has become increasingly relevant is that of climate change. Sites will be degraded by natural processes but and sometimes that is something that you have to accept. Nature would take those sites whether humans were around or not. But with climate change that is being accelerated by human activity we are seeing some types of sites degrade at faster rates. For example rising sea levels submerge and destroy coastal sites and acid rain wears away at rock art and formations. This brings up the question of whether or not people have a responsibility to protect the sites that we are technically destroying. As a general practice I believe that we should look to the tribes that the sites belong to and work according to their wishes. While they may not be exactly sure either, letting them decide what the want and helping them make that a reality is the best way to go about it. It is their history, their culture, and their belongings. Sight. With a field of work that depends on the interpretations your eyes make, it’s relevant, right? Step back for a moment, think about the anomalies in life that make up what we see; the ways in which we recognize and can see differences in relief. In the last three weeks I’ve learned that I see what I am looking for, but seeing what I am supposed to see as an archaeologist is difficult. We’ve spent two weeks learning how to use a compass, operate a total station, a GHSS GPS receiver and even a GSSI Ground Penetrating Radar in order to produce detailed maps of both the surface of archaeological sites and their subsurface deposits. The newer technology provides scientific byways of acquiring knowledge of a site, but oral histories, stories and legend are other culturally rich ways of learning of place and practice. While learning how to use these newer technologies we’ve poured over maps and photos planning the best ways to study a place with as minimal impact as possible. All of these techniques are avenues of sight we are developing and learning how to use. Using the total station paired with Field Genius, a mapping software program, we can see exactly where a point in space once we’ve measured it. Likewise, using Terrasync paired with a GNSS GPS receiver, we can see the lines, points, and polygons, we have created while recording a place. Learning how to use these tools has been an equivalent to drinking straight from a fire hose. More information you thing is possible to process, but the awesome thing about experiential learning is that you do process all of the information given to you. This may not happen in the lab, but in the field, jumping into surveying using these techniques, opened my eyes. No pun intended. For example we left Grand Ronde, OR, for a field trip in the Willamette National Forest to assist the CTGR THPO and the U.S. Forest Service in a surface pedestrian survey. Our instructors had us line up two meters apart and look for anything that didn’t belong. Here’s that experiential learning coming into play as well as the problem of seeing what I’m supposed to see as an archaeologist and tribal historic preservationist. After a few frustrating hours of no finding anything. I finally found something: a rusty hatchet. By the style and wear I’m guessing it was Forest Service issued perhaps a year or two ago. The entire experience made me laugh. You know why? The hatchet didn’t belong. It was neither a representative of the recent occupation by an unauthorized gathering, nor related to the past practices of Mollala, Kalapuya, and Klamath peoples. I realized I had become so focused on finding a particular thing; I was missing everything around me. The absence of something can tell you just as much about a place as the things present. I was looking for lithic debitage, expecting to find obsidian flakes or tools, but I was missing the bigger picture. Briece Edwards, Principal Archaeologist for the CTGR THPO, reiterate over and over, “that once you understand practice, you understand place.” I realized I wasn’t seeing the site as an active place with resources that still used today. In that moment of discovery, the seeing of the sight became much more than surveying and mapping the mountain meadows around me. It became seeing for the first time how a place becomes and remains important. It is not only the objects found or holes dug that make a place or practice important, but also the viewsheds, the freshwater springs, the trees surrounding the meadows, and the visits to a place that leave no material traces. This field trip was a way for me to begin the process of seeing place as living things that have history, artifacts, meaning but also their future. Surveying was a new skill that helped facilitate this. I couldn’t have learning this in a classroom or a lab. It was something I had to learn in the field; making mistakes in order to learn how to constantly adjust my focus so that I wouldn’t miss the bigger picture of a sight, and every sight is worth truly seeing. I am a Native American tribal member of the Confederated Tribes of Grand Ronde. Since I can remember my father has tried to enhance my knowledge of my Native American heritage. He would take me to pow-wows, teach me traditional beadwork and show me how to cook classic Native American foods. When I was younger I loved engaging in these activities, but around sixteen years old I began separating myself from the culture. Like most teenagers, I began concentrating more on school, friends and social activities. When I was eighteen I moved to San Diego for College to pursue an archaeology degree. I took all of the offered archaeology courses, but quickly ran out of classes due to the schools lacking archaeology program. I decided to go back home to Portland and enroll in Portland State University’s archaeology program. I have now been at PSU for 2 years and will be graduating in the Fall of 2015. Moving back to Portland has not only allowed me to enhance my skills in archaeology but has allowed me to reconnect with my cultural ties. Through the means of random luck, I got in touch with the Tribal Historic Preservation Office (THPO) at Grand Ronde. I had the opportunity to meet up with all of the members of the THPO office, one of which was a prestigious archaeologist. They informed me about an indigenous archaeology field school that was taking place on the Grand Ronde tribal land. Once I heard about the field school I could hardly believe that I would have the opportunity to practice archaeology on my own tribal land. I felt as though this was a chance to finally piece together the two things that I am most passionate about in my life. I am now four weeks into the archaeology field school and I could not be happier. I have had the privilege of learning about the Grand Ronde tribes post treaty history and how that has shaped them as a tribe today. I learned about their society, modern culture, and traditional practices. Having the opportunity to be physically present on the tribal grounds has given me a feeling of comfort. I have been wanted to reconnect with my cultural heritage, but felt like archaeology was something that was more important to pursue. Being a part of this field school has not only allowed me to embrace and learn more about my Native American heritage, but has given me the chance to apply archaeological concepts to my own tribe and community of people. Daisy Jaime is currently in her third undergrad year at the University of Washington-Seattle. She comes from the Yakima Valley, born in Western- themed Toppenish and raised in Dinosaur-themed Granger. 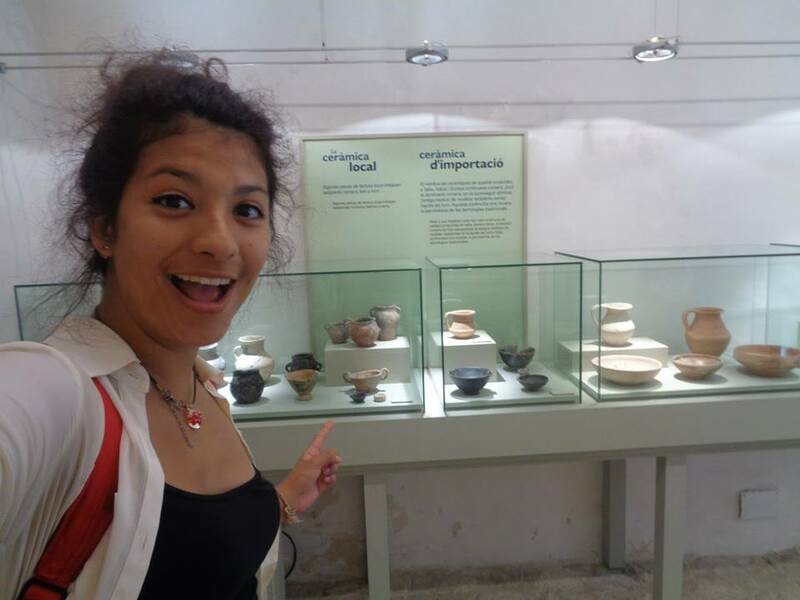 Her curiosity for the past and participation in field school (LEIAP 2014) have encouraged her to double major in History and Archaeological Sciences. Her culture has influenced her to focus on Latin American studies. Daisy’s interest in community- based archaeology led her to join this field school. In the long run, she hopes to one day be able to apply these methods with indigenous communities in Latin America. You can often find Daisy at a local concert (crowd surfing is yet to be crossed off her list), exploring new places in Seattle or binge watching on Netflix. She enjoys running, playing volleyball and trying new food. Scott is an Archaeology major entering his senior year at the University of Washington. He holds three Associates degrees in various fields acquired in past lives. One such life began eight years ago when he sold his soul to the United States Air Force. In return Scott obtained training and experience as an aircraft mechanic while traveling abroad. In addition, he received funding to pursue his second degree. While abroad, Scott encountered several new and exciting cultures. What’s more, is that he was able to see, feel, and experience the physical remains of cultures long since passed. Luckily for him, the Air Force only had a claim to his soul for two more years. Upon completing those years, Scott promptly moved back home to Washington to pursue an education in Archaeology. Since moving back to the Northwest, Scott has attempted to juggle school, work, and family. While all three are important, he has dropped the ball for each more times than he’d like to admit. With the help of his wife of ten years, and two young children, the show continues. Scott is a practical man, and though he separated from the active duty Air Force, he continues to make himself presentable once a month to play Air Force with the Reserves. How else is a student supposed to keep a family reasonably insured? When not wondering how he’s going to keep his family in food, shelter, and clothes, Scott likes to think he will make the archaeological discovery of the century, write a book, make a movie, and be set for life. After awaking from that dream, Scott likes to spend time with his family, ride his motorcycle, travel, and spend money he doesn’t have. After the creditors catch up to him, he will most likely look at getting a job in Cultural Resource Management or try to hide in the University’s graduate program. If those options don’t work, Scott has heard the Air Force will take unemployed archaeologists with souls. Kandice Joyner is a senior at the University of Washington. While in the city she is earning her Bachelors Degree in Anthropology with a focus in Archaeological Sciences and a minor in American Indian Studies. Kandice is a farm kid from the Okanogan Valley in North Central Washington. She grew up driving tractor, riding horses, and raising hay on her family farm. A country girl at heart she is in the outdoors as much as she can. You’ll find her by a campfire with friends or hiking the many trails in Washington. The outdoors is a big part of why she loves what she studies, but it’s not the only thing. Kandice loves stories; she enjoys listening to people, hearing what they see, and how they interpret the world around us. Not all stories have happy endings, but they do have lessons. Even happy ending stories do. Oral histories, myth, and beliefs are avenues in which we learn these lessons. The lessons and stories are becoming “validated” tools for reevaluating sites and landscapes, to bring more information about place and personhood. These stories and histories are just as important today as they ever have been. Kandice is passionate about how stories and people collide, especially the cause and effect of place, person, and story on each other. She is passionate about working with people to collectively write a better, multi-vocal story for our children’s children about the land, our people, and our world. This is where her story and yours collide. She is here as a guest, a student, and hopefully soon a friend, during her stay at field school. The FMIA project was something she knew she wanted to be at while Prof. Gonzalez explained what it was in class last fall. Community based archaeology is the methodology she hopes and aims to work by after graduation. 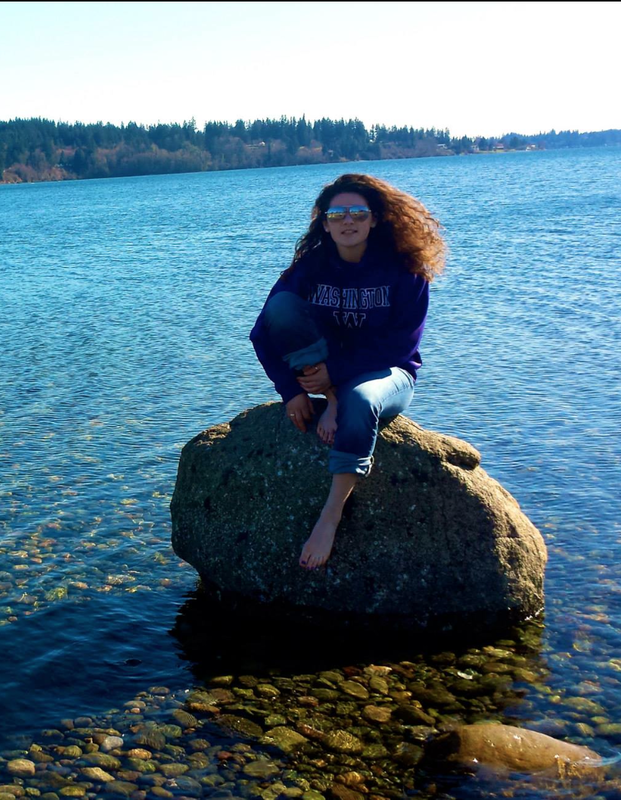 My name is Jessica Boggs and I am an undergraduate at the University of Washington majoring in Archaeological Science. I am currently in my senior year and plan to continue my education within UW’s post-graduate Anthropology program. My interests include Pacific Northwest history and prehistory, specifically the effects that climate change and coastal geomorphology has had on local landscapes and human settlement, and the relevance of past anthropogenic landscapes in relation to current and future management processes involving forests, fish, and wildlife. In addition to archaeological research, the existing wealth of knowledge preserved through tribal oral histories passed from generation to generation since time immemorial, has proven highly beneficial in planning for various aspects of landscape management, and an array of other topics. I chose to enroll in the FMIA because it takes place in the Pacific Northwest region, and is a collaborative community based program with and for the Confederated Tribes of Grand Ronde. This environment offers a unique opportunity to learn archaeological research methods using a collaborative model, and places us in a position to work directly with and for the CTGR Tribal Historic Preservation Office.